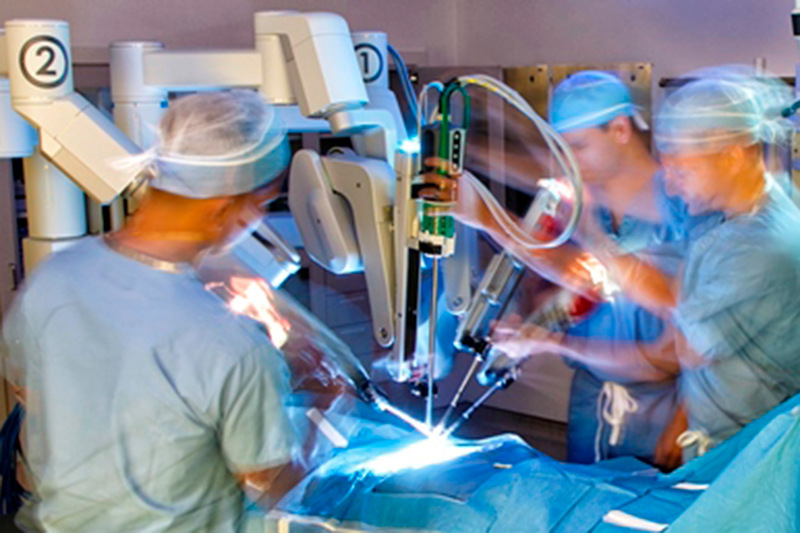 Robotic-assisted surgery is revolutionizing the way physicians operate on patients. At Hackensack Meridian Health Jersey Shore University Medical Center, our robotic surgical team provides an unmatched level of clinical excellence and expertise, supported through innovative solutions and technologies. Our surgeons have been performing state-of-the-art minimally invasive robotic surgery in a variety of specialties for over a decade and are now using the daVinci XI® robot, the most advanced robotic technology available. Robot-assisted laparoscopic surgery entails the use of a surgical robot to facilitate the performance of complex operations without the need for a large incision. By combining robotics and state-of-the-art technology, surgeons can operate with greater dexterity and control than with traditional surgical approaches – ensuring the best possible outcome for each patient. What is the da Vinci XI® Surgical System? Surgeons using the da Vinci sit at a console where they have a three-dimensional view of their operating field. Below the screen, they work the master controls that guide the robotic arms, which manipulate the instruments and insert a tiny camera that enables them to see inside the patient. The surgical robot is unique because it provides 10x magnification, a three-dimensional view, and instrument arms that provide our surgeons with 7 degrees of freedom, allowing for movements that mimic a human wrist. What Robotic Surgery Procedures are available at Jersey Shore University Medical Center? By combining robotics and state-of-the-art computer technology, surgeons can operate with greater dexterity and control than with traditional surgical approaches.